Rosenzweig Lumber came into being in 1922. Its origins, however, trace back to 1898 with two predecessor companies, Rosenzweig & Usitzky and Rosenzweig & Elson. The common thread is Isaac Rosenzweig (1866-1956). Isaac Rosenzweig was an emigrant from Russia and a cabinet maker, who became an American citizen 13 March 1896. On his naturalization petition Isaac Rosenzweig said that he was born 8 May 1866 and that he arrived in the U. S. at the port of New York 6 March 1889. He lived at the time at 226 East Broadway, New York City. He can be found in census reports from 1910 through 1940, always born Russia, and immigrated either 1889 or 1890. The census, however, gives his age as slightly younger than the naturalization petition. Mostly the census has him born 1870. As a cabinet maker Isaac Rosenzweig appeared in city directories beginning in 1898 as Rosenzweig & Usitzky located at 303 Canal St. In 1901 this business became Rosenzweig & Elson at the same address. By 1912 they had moved to 45 Great Jones St. Then in 1922 The New York Lumber Trade Journal, 1 March 1922, reported, "Rosenzweig Lumber Co. has succeeded to the business of Rosenzweig & Elson, 45 Great Jones street. Mr. Elson has retired from the firm." 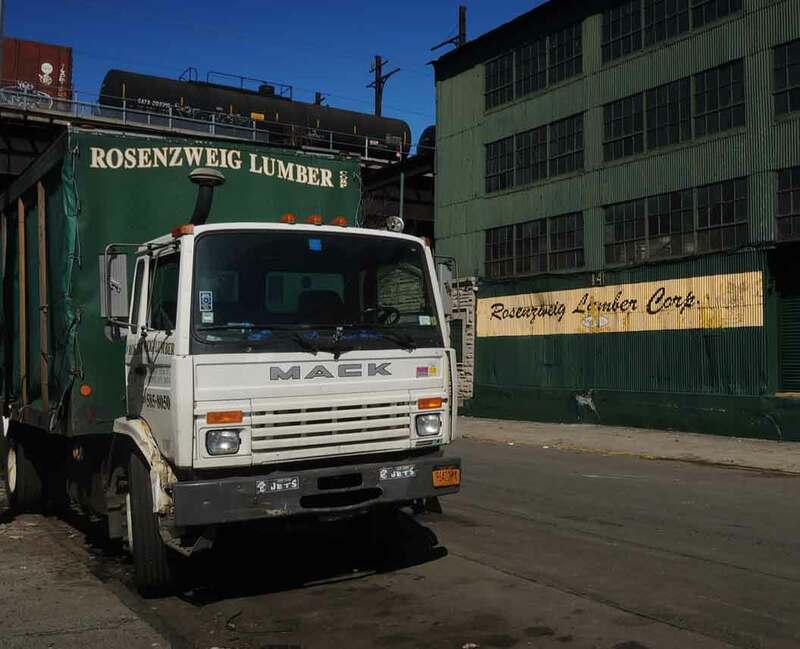 Rosenzweig Lumber, then, began in 1922 at 45 Great Jones St., moved several times during the years 1922 to 1954, then relocated to 801 East 135th St., the Bronx, in 1954. They currently (September 2016) occupy at least two buildings along 135th Street between Willow Ave. and Walnut Ave. in the Port Morris area of the South Bronx. Isaac Rosenzweig's partner from 1898 to 1901 was Isaac Usitzky (1869-?). Like Rosenzweig he was an emigrant from Russia, and he became a U. S. citizen in 1896. On his naturalization petition he said that he was born 13 Dec 1869 and that he arrived in the U. S. at the port of New York 26 June 1890. He lived at the time at 130 Suffolk St., New York City. Both his petition and Rosenzweig's were witnessed by David Sebludof, 186 Norfolk St. NYC / Turner. Isaac Rosenzweig's partner from 1901 to 1922 was Isaac Elson (1870?-1956). Like Rosenzweig and Usitzky he was an emigrant from Russia ca. 1890, and he can be found in census reports from 1905 through 1940 living in the Bronx. After his partnership with Rosenzweig, he stayed in the lumber business as the Elson Lumber Co. and the Elson Plywood Co., which were in business at 217 W. 21st St. from the 1930s to 1960.